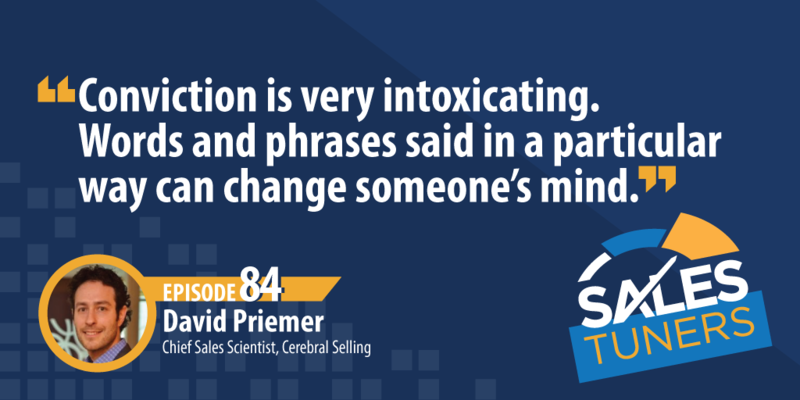 From his early days tinkering with test tubes and differential equations as an award-winning scientist to leading top performing sales teams at high growth tech startups, David Priemer (@dpriemer) is a “sales scientist.” David is the founder of Cerebral Selling, bringing with him more than 20 years of B2B Enterprise Sales including five years at Salesforce. Although David admittedly fell into sales, he’s now on a mission to inspire more people to intentionally get into sales as their chosen profession. Through his consulting, he aims to help salespeople outrun the ghosts of the sleazy used car salesmen by building armies of amazing reps who their customers love. One key to success David talks about is to learn the success stories or the experiences of those in your organization to create mindshare that resonates with your end buyer. He also suggests leaning into your customer’s stories to cultivate a challenger mindset. For David, time well spent is with customers learning how they think to look for opportunities to add value. Learn How to Learn: When tackling any new topic or initiative the first question you have to ask yourself is “why.” The second question should be “how.” Using the notion of synthesis, take all the artifacts, insights, and data points you can find from a variety of sources and then apply it to your own situation. This should help you determine at least one hypothesis as a starting point. And for crying out loud, pick up a book and start reading. Remember Who the Credibility Belongs To: No one cares what you know or what you think. The truth is, prospects are looking for a way to prove salespeople wrong. So, when you don’t have credibility, invoke those that do — i.e. your customers or external reports. When you can cite 3rd party research or share stories from successful customers, your story is more likely to stick. Every Objection Has a Hidden Meaning: Regardless of the type of objection you hear, you have to get to the root cause of the statement. While your prospect may seem to be evoking logic, there is always an underlying emotional reason. Find it and you’ll unlock the path to getting a deal done. One good exercise to go through on this is to state the objection and then insert a blank. If your prospect says “it’s too expensive,” go through all the possible things that could follow that statement to get to the root cause.